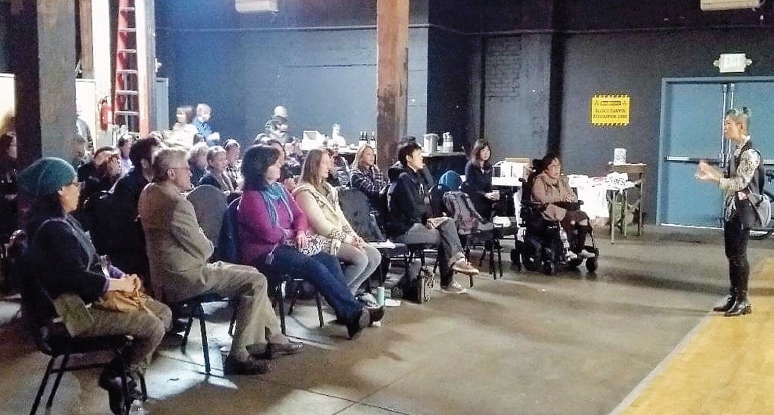 On Saturday, March 9, the Art Share Auditorium in Little Tokyo/Art District was packed with local activists who gathered for the North American Premiere of “Fukushima Speaks,” a 2018 documentary about the Fukushima Daiichi nuclear disaster. One day before (considering the time difference between USA and Japan), the eighth anniversary of the Great Tohoku Quake and Tsunami, which claimed the lives of over 18,000 people and initiated the nuclear accident, we came together not only to commemorate the lives of the victims but also to witness the very current suffering of its survivors. The temptation to put it behind in the past is great, because the reality is too overwhelming, too emotionally draining to face. And with “the Restoration Olympics” to be held in 2020, the greatest publicity stunt coordinated by the Japanese government, many in the world may have been led to believe that the Fukushima nuclear disaster has been dealt with, and that we can now move on. Toshikuni Doi is a Japanese independent journalist and award-winning filmmaker who, during his expansive career of over 30 years, has been giving voice to the silenced and forgotten: Palestinian refugees in the occupied territories, Korean A-bomb victims, Korean women forced into sexual slavery by the Imperial Japanese Army during WWII, and civilian victims of war and torture in Fallujah, Iraq. In April 2014, he took on the project to document the voices of the Fukushima victims. A post-screening discussion of “Fukushima Speaks” at the Art Share Auditorium. After four years of collecting nearly 100 testimonies, “Fukushima Speaks” came about, featuring 14 distinct stories of despair, resentment, agony, sorrow, and the will to survive. A schoolteacher, an evacuee herself, keeps the community together by sending handwritten newsletters to her former students who have become scattered all over Japan after the accident due to a mandatory evacuation order. She gives us snapshots of the prejudice that child evacuees face. Many choose to hide where they are from, for fear of being bullied. An evacuee mother expresses frustration with her husband, who does not share her concerns for their children’s health. With 35% of Fukushima children diagnosed with thyroid abnormalities, many mothers choose to evacuate with their children, leaving the husbands behind. The living arrangement is stressful for both parties and often ends up in divorce. The nuclear disaster broke up what used to be tight-knit families and communities. Those who have evacuated “voluntarily” and do not participate in the “restoration” efforts are seen as troublemakers and deemed selfish in a society where silence is golden and gaman (perseverance) is considered one of the most redeeming qualities of a person. There are feelings of resentment among people who remain in Fukushima toward those who have evacuated. They claim the evacuees give Fukushima a bad name for fueling the perception that Fukushima is uninhabitable. “We all were in Fukushima and suffered the same disaster, so why must we fight? It doesn’t make sense. We are being confused so we won’t see who the real enemy is,” a voluntary evacuee remarks. The film is a reminder to all of us in California of the nuclear dangers that we currently face. After the screening, an impassioned call was made by Harvey “Sluggo” Wasserman, host of “The California Solartopia/Green Power Wellness Show,” for an immediate shutdown of Diablo Canyon. Libbe HaLevy, host/producer of “Nuclear Hotseat” and a Three Mile Island survivor, talked about the importance of turning our rage, sorrow, and despair into the energy to carry on the fight. The most extraordinary thing about “Fukushima Speaks” is its ability to bridge the emotional distance between the audience and people in the film. Interviews are conducted in a conversational style between the subject and Doi the director, and at times it feels as if we were sitting in a room with them. Doi took the time to bring out the human beings behind the victimhood, in some cases revisiting a person’s life in the course of two-and-a-half years. Through his filmmaking, Doi attempts to honor and restore their dignity, and as an audience, we are privileged to take part in it. We are reminded of what we are fighting so hard to protect. Our families. Our communities. Our livelihood. Our future. And our own dignity. According to Fukushima Prefecture, the number of the evacuees decreased from 73,000 in March 2017 to 41,300 in March 2018. While these figures are being used to promote an image that the restoration is in progress, in reality the decrease in numbers mainly comes from the termination and downsizing of the government aid programs. As the Fukushima prefectural government terminated all housing subsidies as of March 2019, many will be forced to return to areas that are unsafe by the international standard. Some will end up on the street or choose to take their own lives because of the crushing sense of despair, loss of hope, social isolation, and psychological and financial hardships. These suicides will not be included in the official number of “the casualties” of the Great Quake and Tsunami, let alone of the Fukushima nuclear disaster. Michiko Kato, a member of our community here in Los Angeles and a Fukushima survivor who has been offering her testimonies of courage and hope for so many years, is battling cancer once again, despite having conquered ovarian cancer in 2014. She requires our support to triumph over the disease once again for herself and her 10-year-old son, whom she raises on her own as a single mother. For those who are willing to help, please go to the fundraising site — https://www.gofundme.com/let039s-support-michiko — and donate. Also for screening opportunities for “Fukushima Speaks,” please contact me at [email protected] or (323) 899-0463. No screening is too small; you can gather 10 of your friends and make it happen.